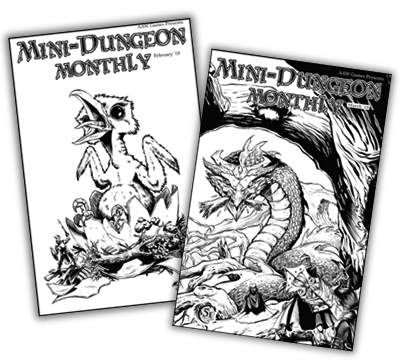 Inspired by classic titles like Judges Guild and Alarums & Excursions, inside each issue of Mini-Dungeon Monthly are five short adventures with brand new illustrations by Mates Laurentiu and cartography by Justin Andrew Mason. We offer a wide range of adventures for a variety of levels. In issue one characters will climb into a roc's nest to fight hatchlings, try to survive in a crypt filled with vampires, confront a mendacious naga, stop a general from obtaining unfathomable power, and figure out what horrific otherworldly thing is making people go insane. PDF issues are available individually or as part of a zine subscription. Designed as one-color print, each issue is available in print. Subscribers obtain access to purchase the print version of the zine at cost + shipping & handling from DriveThruRPG.com (roughly $2.50+S&H). We print in the USA and UK using OneBookShelf/Lightning Source. 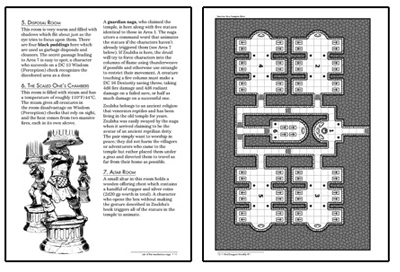 All subscribers get bonus digital content with each Mini-Dungeon Monthly issue, including full-color, high-resolution Virtual Tabletop maps, digital monster and NPC tokens, and printable mini art posters. Click here to get the Mini-Dungeon Tome! Over 130 exciting adventures in one book! To find your perfect adventure, select your options below and then click the Search Button. You can also click here to view all adventures. Copyright 2019 AAW GAMES LLC. Mini-Dungeon Monthly Adventure Assistant developed by Justin Andrew Mason.